There is no more satisfying sight than a creative team improving on their previous output. The first volume of Stumptown set the bar astronomically high; The Case of the Baby in the Velvet Case surpasses it. When rock star Mim Bracca walks into the office of Stumptown Investigations with a seemingly open-and-shut case involving her missing ‘baby’ – her prized guitar – Dex Parios is quick to accept the job. After the events of The Case of the Girl Who Took Her Shampoo (But Left Her Mini), which saw Dex take on crime lord Hector Marenco, Portland’s dogged investigator’s list of prospective clients has halved. Quite frankly, whatever the job, she’ll take it. Of course, nothing is ever as simple as it seems – especially not for Dex, who quickly learns it’s not just the guitar that’s gone missing. Several opposing forces, including the DEA and amped-up skinheads, are looking for the guitar and its precious addition, and once again Dex is in the middle of it. The highlight of The Case of the Baby in the Velvet Case is the high-speed chase between Dex, a couple of skinheads, and the Portland police. While Matthew Southworth’s art isn’t as refined as it was in Stumptown: Volume 1, the diminution of its overall detail is worth it for the vehicular pursuit alone. Perfectly choreographed and perfectly paced, you can feel the acceleration and adrenaline on the page. A long time ago I was told it’s almost impossible to pull off car chases in comics; Greg Rucka and Southworth have put that argument to bed. Dex winds up the case in routine but satisfying fashion. The journey towards its conclusion, however, is fantastic. There’s no doubt, Greg Rucka is writing the best crime series in comics. Crime fiction is littered with private detectives, but few have punctuated the genre like Dex Parios. Oh, sure, the proprietor of Stumptown Investigations hasn’t yet achieved the resonance of Rockford, Spade, Spenser or Marlowe – but give it time. 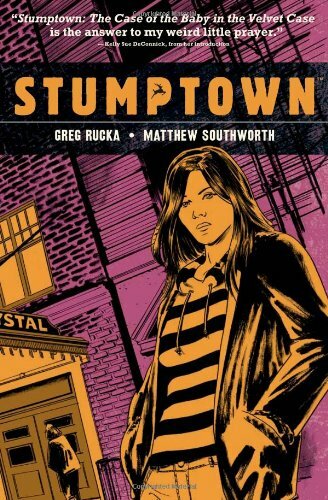 Thanks to her incorrigible knack of landing herself in hot water, showcased in the opening pages of Stumptown: Volume One, when she is ruthlessly gunned down by a couple of thugs, Dex is destined to earn a place among that echelon. The Case of the Girl Who Took Her Shampoo (But Left Her Mini) introduces Dex as a talented investigator, but a screw-up in just about every other aspect of her life. She owes the Confederated Tribes of the Wind Coast’s casino almost eight thousand dollars; and with her credit cards maxed out, and less than a hundred bucks to her name, she’s in no position to pay it off, or negotiate when the casino’s manager offers an opportunity to clear the debt. Seems the manager’s granddaughter has gone missing – maybe run off with a boy, maybe not – and Dex’s particular set of skills could be of use in discerning her whereabouts. Unfortunately for Dex, Charlotte’s whereabouts requite a detour through Portand’s seedier districts. Rather than implementing the stereotypical noir-soaked first person narrative readers might expect, writer Greg Rucka avoids captions entirely, leaving artist Matthew Southworth to carry the heavy load of portraying Dex’s emotions and hinting at her thoughts. It’s a wise move – Southworth is up to the challenge. Stumptown is a comic that necessitates artistic excellence in the quieter moments, as a large portion of the narrative involve non-violent confrontations. Southworth effortlessly renders these scenes, choreographing conversations for maximum readability. His fellow colourists, Lee Loughridge and Rico Renzi, also deserve massive credit for their chosen palette, which is stultified, but never anything less than evocative. 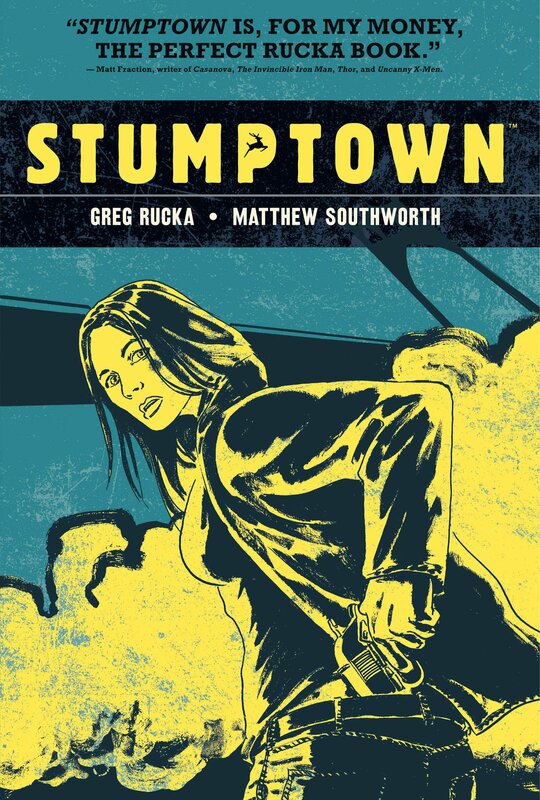 The Case of the Girl Who Took Her Shampoo (But Left Her Mini) sets an astronomically high bar for future volumes of Stumptown, but given Rucka’s track record, few will doubt his capacity for betterment. Bring it on, Dex. BRAVO reads like a Tom Clancy novel on speed. Pared down and raw, unlike many of Clancy’s padded efforts, BRAVO is the apex in Rucka’s espionage writing career; the second in the Jad Bell series, and surely not the last. I wasn’t wholly satisfied with ALPHA, the first Bell novel, despite some exhilarating moments, and the pulse-pounding scenario of a hostage situation in a theme park. I criticised it for leaving too many dangling threads; I appreciated it was intentionally written this way, but felt it didn’t stand alone as a potent addition to an overcrowded genre. I admitted, however, that my opinion was likely to change after reading the second installment, and taking into account the overarching narrative (which doesn’t entirely wrap up in BRAVO, either). Let me put it this way: after reading BRAVO, I’ve developed a newfound appreciation for ALPHA, and together, these two novels represent the finest espionage and thriller fiction I’ve read in years. BRAVO follows on from the events of ALPHA – beware, newcomers; you’ll want to read this series in order. Bell and his crack team are tasked with bringing in the Uzbek – the man organizer behind the Wilsonville terrorist attack. Of course, this task isn’t as simple as it seems – the Uzbek’s employer, an enigmatic figure dubbed The Architect, has plotted another attack on American soil, this one more devastating than the last – and worse still, it appears shadowy figures within the American government are funding the plot. On paper, this sounds very formulaic, and to some extent there is a smidgen of familiarity to the narrative. 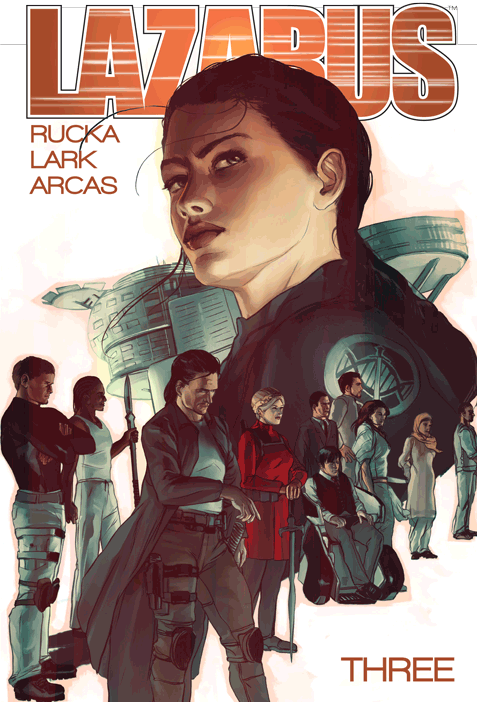 But Rucka makes some intriguing decisions with his prose that really pay off and pushes BRAVO firmly into the A-grade. Rucka implements a distinctive third person viewpoint in the present tense, and he shifts between characters and moments with a deftness only capable by a master of the form. The characters are layered; their self-doubt mingles with the arrogance required of elite soldiers and deep cover operatives. In ALPHA, Bell felt one-dimensional and somewhat plastic: in BRAVO, a story that has far more breadth, we see him for what he truly is, wrinkles and all, and a fine addition to espionage fiction’s highest echelons of characters. So, read ALPHA, take a moment, then read BRAVO. But take your time. Savour the novels. Because then, like me, you’ll be on tenterhooks waiting for Rucka’s next. My thanks to Net Galley and the publisher for providing a review copy of BRAVO. Greg Rucka’s run on DETECTIVE COMICS in the early 2000s was seminal, and his subsequent work on titles such as THE ADVENTURES OF SUPERMAN, WOLVERINE, THE PUNISHER and WONDER WOMAN pushed him into the highest echelon of mainstream comic writers. His independent comics work – QUEEN & COUNTRY and STUMPTOWN in particular – accentuated his status, and early signs indicate that LAZARUS is going to cement him there for ever. Versatility is an underrated quality in a writer and Greg Rucka has it in spades. Not only is he a master of two mediums – check out his Atticus Kodiak prose series if you’re looking for some Jack Reacher-esque action – but his narratives, despite often sharing similar themes (a strong female lead chief among them) there’s a clear disparity between each one. 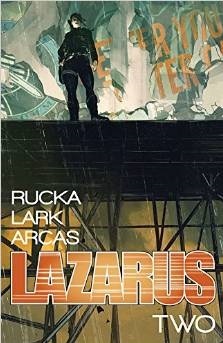 LAZARUS is nothing like Rucka’s other comics work – but it nevertheless feels very much like a Rucka-penned tale, which is definitely a positive. Volume One of LAZARUS introduces us to the new world. We don’t when this is taking place or how the world came to be so messed up – perhaps that information will trickle down over time, perhaps not, it’s not really the point – but what we do know is that the world is now divided by financial power players. Wealthy families define geographic boundaries, and in each family there is a Lazarus – a warrior – who is a tangible representation of the each family’s financial capability. LAZARUS is the story about the lazarus from the Carlyle Family. Her name is Forever – and from the very beginning we discover she has doubts about her imposed destiny; doubts that will likely fester throughout the series (the length of which is so far undetermined, readers beware; you might be in for five volumes or 35!). Rucka is partnered by an art team consisting of Michael Lark and Santi Arcas, who have worked in tandem to create something very special indeed. Lark has a realistic style, which makes LAZARUS easily digestible for those unfamiliar with graphic storytelling. The page layouts are simple but effective – this might be some of Lark’s best work since his run on DAREDEVIL for Marvel Comics in the mid-2000s. 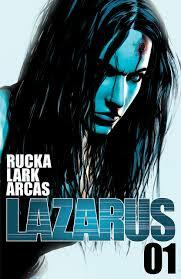 This first volume of LAZARUS serves as a solid introduction to the chief characters and the world they inhabit, and comes highly recommended.